Anjulie | OBGYN Glendale, Avondale & Surprise | Gynecology at it's best. Anjulie first knew she wanted to deliver babies when she just a young and energetic high school student and completed a project on the miracle of birth. From that time on, she has been unable to imagine a more rewarding career. Anjulie’s collegiate journey began with obtaining a Bachelor of Arts in English which was followed up by a Bachelor of Science in Nursing, both from Auburn University. Since receiving her nursing degree in 2007, Anjulie has worked in a number of areas to include labor and delivery, emergency medicine, telemetry, medical surgical, rehabilitation, and occupational health. In 2012, she decided to follow her heart and achieve her dream of assisting women in bringing life into the world. 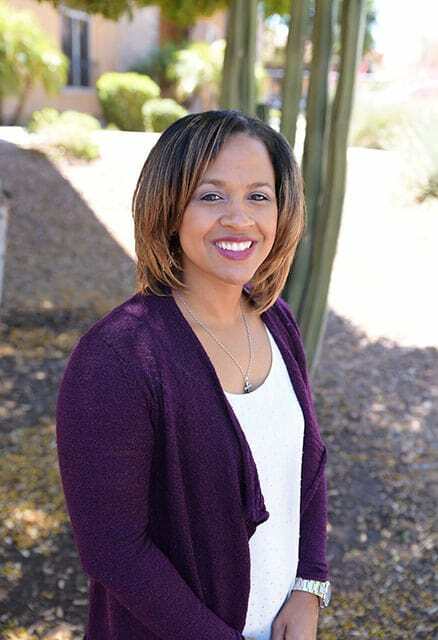 Anjulie graduated with honors from Georgetown University with her Master of Science in Nursing and is board certified as a nurse midwife and women’s health nurse practitioner. She feels blessed to have such a rewarding career. In her free time, she enjoys spending time with her loving husband and two beautiful children. My whole experience with Arizona Maternity was beyond beautiful. I’m so thankful for Shaunte and Jocelyn they not only made each visit memorable the care I received from them was truly passionate. The birth of my daughter Brooklyn was magical and Jocelyn was by my side the entire time. Before going to Arizona Maternity I was not educated on what Midwifes do. Jocelyn was my cheerleader she made me feel so comfortable and talked me through every step. I’m so thankful for the team at Arizona Maternity. I will never forget this amazing experience. Thank you so much. I started going there a couple of weeks ago. Dr. Brar is absolutely wonderful! She explains things thoroughly and really takes time with her patients to make sure they understand. The staff is very friendly as well. I love that Arizona Maternity has all female Providers from Nurse practitioners to Midwives! The staff is always friendly and helpful too which made my experience very nice. Major Insurances accepted, including Medicare, All AHCCCS plans (Except APIPA UHC), BCBS OF AZ, Cigna, Aetna, United Healthcare and more. © Copyright Arizona Maternity Clinic. All rights reserved.